I’ve already mentioned that we had to make a big push today to get back on track so I can get home and get back to work on time. Well, that big push just about killed us all, I think. It wasn’t enough that we were stuck in the car for 15 hours today, but we were stuck in the car for 14 of the most boring hours of the trip. I honetly can’t even tell you exactly where we were, only that we took I-80 for a while and ended up in Idaho. We just keyed the address for the campground into Sheila and took off at seven this morning. We got to see some more mountains on our way out of California, but once we hit Nevada there wasn’t much else to see. And to make matters worse, Nevada has the noisest highways I’ve ever been on. Someone needs to show them how to cut grooves in the concrete so the tires don’t whine so much when you’re it. 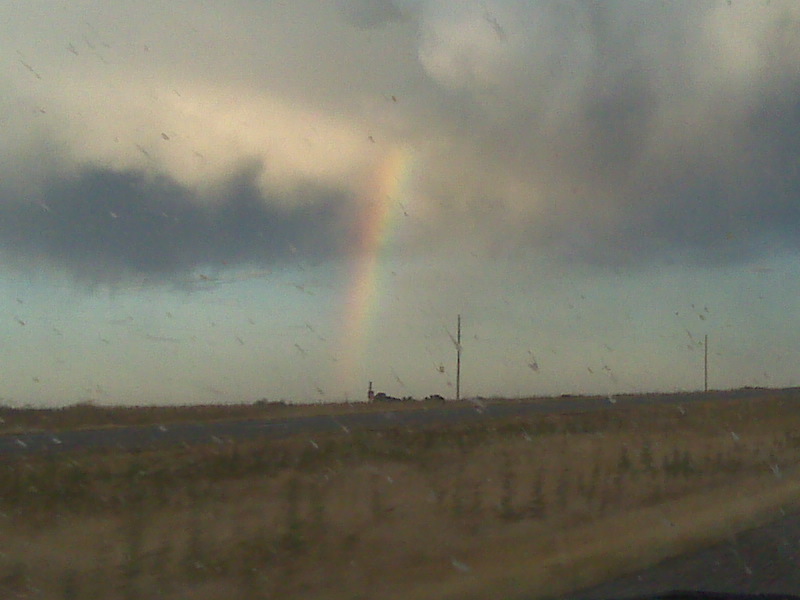 I think the prettiest thing we saw today was the rainbow in Idaho about an hour from Idaho Falls. The rest of the way was farmland. And bugs. Millions and millions of bugs.